The market feels barren and disconnected from the street and is inhospitable to families looking to enjoy a meal together. My wife and I spent some time at the Market a week ago Saturday. Our kids wanted to eat lunch there so we took them for some shopping and food. We got chatting about the recent news about the Market's poor performance and both made some observations just in our time there. I'll share them in no particular order with some suggestions. First of all, the seating is horrible. Our family of five can never find a table because all of them are bolted down furniture with a maximum of four seats, and they are always taken. We always end up with a kid sitting on our lap. While we were there having lunch, another family came and said, "Oh there's nowhere to sit, let's go". There were only about eight of us sitting and eating, but due to the inflexible chairs and huge lack of chairs, a family was turned away from having lunch. So here's my first suggestion: Get rid of the white tables and chairs downstairs and in the front foyer area and replace them with a lot of Paris-style chairs and round tables. People can have a table for two, or assemble a group of ten together if they want. Plus, you'll be able to add more seating this way, especially up in the front area where it is completely empty. Have a pile more of these tables/chairs for spring-fall and have them available outside on the cobblestone area of the sidewalk on York. Let people eat outside in the nice weather. Speaking of which, I notieced this when the renovation was complete, and sure enough it has become a real problem: the market still doesn't open to the street. Our kids and us love the samosas from Sensational Samos so we chose to eat there, but the ambiance in the front glassed-in foyer is dead. It's like eating lunch in a hospital cafeteria. Get rid of the front vestibule and everything. Just the doors from York and viola, you're in the market. In summer with the sliding panels open to the sidewalk, people will actually be able to hear, see and smell the market. Considering the street: the city needs to plant some street trees in the cobblestone section on York: trees that will grow big, fast. Then, we have the above-mentioned tables and chairs in a nice leafy streetscape. That strip currently feels barren, and let's be honest - it's kind of a boring street with an empty wall across the street and parking garage on the other corner. We need to animate it as much as possible on the market side. Someday it would be great to have a retail/cafe establishment on the ground floor of the parking garage facing York/McNab. If the community kitchen space is no longer being used, perhaps look at re-arranging that corner to allow for a prepared food/lunch type of establishment to set up shop near the seating area. Think Byward Market in Ottawa. We go there all the time and there are tons of lunch options. Finally, I would explore the option of a baker/pizza/panini type establishment being located at street level along with Sensational Samosa. Now, with all the tables and chairs filling the rest of that space and overlooking the entire market and spilling out onto York, there would be a much more enjoyable market destination vibe. I'm glad to hear that better signage is on the way, but honestly I must say that these issues I'm bringing up are probably a much greater detriment than a sign or free parking. Hope this helps, and I hope some of the simpler/quick-win ideas like new tables/chairs and street trees could be seriously considered. Honestly, I said this from the start, but that glass partition has to go. Open the market to the sidewalk. Stall holders that operate within the same hours as the market would be a pleasant improvement for me. Turned around too many times lately to find what I need under a blanket because a stall holder doesn't start till a little later as their neighbor lets me know. I think that happens because the hours are a mish-mash of grocer's hours and farmer's market hours. A grocery store doesn't open at 6, but a farmer's market for actual farmers doesn't open 4 days a week. Farmers have more work to do than selling. AFAIK there's a market in K/W that has two separate areas - one is the Hamilton-style "all week" market that opens normal grocery store hours, and the other is the "actual farmers" area that's open only one or two days a week. That would be a good model for Hamilton. Say like 7am-2pm Tuesdays and Saturdays for the Actual Farmers Market, and then 830am-6pm Tuesday to Saturday for the Market. The York Blvd area would be good for the "Actual Farmers" area since it has its own entrance and could be closed off from the main Farmer's Market. The York Blvd area also has the advantage that in the warmer months it can expand out into the street, and that's also when farmers have more wares to sell. Yes, that's part of the problem. But starting at 6am doesn't really make much sense. Who is going to the market between 6 and 8 in the morning anyway? They would capture much more business if they could actually be open 8am-6pm. In any case, calling it a "Farmer's Market" seems to be an attempt to use a description with positive associations, rather than describe what it is actually is: a traditional indoor public market. There are very few actual farmers at the market (at least those doing the farming, although there are some farm families represented), but there is nothing wrong with that. Traditional markets are supposed to be open regular hours, year round, and their attraction is the variety from the different stands, personal service, and emphasis on meats, prepared goods, and produce that are local and higher quality than you would get in a supermarket. There are also markets that try to compete on price, at the expense of lower quality goods, but I don't think that is what Hamilton's market should (or can) be. Markets often expand in the summer to include more actual farmers selling from the back of trucks and that is what the Market tried last summer by opening up the big doors on York and having seasonal fruit and vegetable stands. Make it clear that this is a year-round public market that competes with the supermarkets on quality, selection, personal service and local origin . This means regular easy to remember hours (say Tuesday-Saturday, 8am-6pm) and requiring stall holders to actually be open and reasonably well stocked during all open days. No more shutting down at 2 or 3pm on a Saturday. Stall holders should have to find replacements to cover annual holidays (just like other small businesses) and shouldn't just close down during the week because business seems slow, or on random days unless there is an emergency. Expand the offering of local fruits and vegetables in the summer by continuing and expanding last year's trial of street side stands on York boulevard. Exactly, as I said, the main stalls shouldn't open at 6am, but space should remain available for a proper traditional farmer's market that's open 1 or 2 mornings a week. The traditional market format works everywhere else, only Hamilton insists on its 4-day all-day schedule. I don't know why traditional farmer's markets open so freakishly early and shut down at noon, but I assume there are good reasons for it. And it would be nice for the market to have some space that's appropriate for actual farmers. That's why I think the best approach is to split the market - one part into a proper traditional farmer's market, and one, as you say, into a "Hamilton Market" sporting normal store hours - 5 or 6 days a week, 8-6 or something like that. The York Blvd street-side area works best for the traditional Farmer's Market because both the produce and the space will expand in the warmer months. Spin it off as a nonprofit and unleash the entrepreneurial spirit of current and future vendors. Can't think of a good reason why the city and taxpayers should be in the business of running a farmers' market (same could be said for golf courses,a water park and children's museum). Free up councillors to focus on essential services and strategic priorities. Invest some serious money in branding and marketing. For starters, compare the Hamilton Farmers' Market website with Evergreen, the Byward Market in Ottawa and the London Farmers' Market. What's the unique value proposition for the Hamilton Farmers' Market? Who's the target market? Welcome food truck operators to set up shop. A place to be in the winter and to make the jump from food truck operations to a bricks and mortar business. Market could be an incubator for restaurant start-ups and where established butchers and bakers in Hamilton set up satellite businesses. Close off a stretch of York Blvd on Saturdays in the summer and move vendors onto the street (who wants to be in the basement of a concrete bunker when the sun's shining?). Have to think that if the Farmers' Market offers customers a unique and consistently excellent experience, there won't be any need to offer free parking at the taxpayer owned garage. If going to the market is a weekly event not to be missed, most of us will happily pay $2.50. A very basic change, which is just enforcing the current rules, would be to insist that the stalls are actually open when the market is open. Officially, the market is open Tuesday, Thursday, Friday and Saturday until 6pm. But, even on Saturday, if I show up after 3pm (three full hours before closing) many stands are shutting down, or sold out of staples (e.g. the chicken stand has no more chicken breasts). If they are selling out 3 hours before closing then either business is so good they can't keep up, or they are running a subsistence stand were they are more concerned about not over-buying than actually doing good business). They are in the perishable goods business, and that means knowing how to manage perishable stock properly. By shutting down before 4:30 or 5:00 many stallholders also miss out on potential business from office workers downtown, who would buy food on the way home from work. Competing with Nations at the very least means have reliable business hours! After experiencing stalls being out of basics on Saturday by 3pm a few times, you get to feel you can't rely on the market for weekly groceries! Even more striking is that during the week many stalls are simply closed. It is already annoying enough for most people to remember when the market is actually open (closed Mondays and Wednesdays as well as Sundays), but they should at least be confident that the stands will be open and reasonably well-stocked until closing time. I have to agree that the biggest failure in the reno, for me, has been the destruction of a single coherent food court. Both the old market and the temporary market had large seating areas surrounded by vendors that focus on ready-to-eat foods. The renovated market completely lost that floor-plan - the seating area is smaller, and iirc there's only one lunch-seller directly facing it. I'm sure a lot of folks made lunch and shopping at the market a Saturday ritual, and the layout is no longer conducive to that. Also, the complete isolation of Sensational Somosas (and the incredibly long delay before they opened - remember that?) is confusing. But honestly, I'm not fond of their stuff anyways - I prefer the somosas from the place at the bottom of the ramp. Been trying very hard to support the farmer's market. The hours are the biggest problem; I can't stop for groceries on my way home from work. Even if I do half the vendors aren't there. So it's Saturday trips from up the mountain, or not at all. Prepared food is lacking; seemed scattered around and nothing of substance. You had to know in advance who had what. I know where to find the samosas but where's the food? Anyone there make deli sandwiches? Was I not looking hard enough? Anyway I like getting my steaks and cheesecake from there, try to go weekly in the summer. Last time I went a couple of the stalls I needed were closed, haven't been back. But all that above is trivial compared to the single biggest problem downtown. We have no culture of outdoor patios. I'm not saying for right now in the middle of January, but someone above said the food court seating was pathetic. It is. There should be patio tables inside and out, european food court style, this should have been thought of. Not a total of four McDonalds style fast food tables. Make the place somewhere you want to go and hang out. Spend money at prepared food stalls. Have a deli sandwich and beer, or hot dog with the kids. Buy some groceries from vendor stalls that are actually open. The place should be bumpin' all weekend, not just for four hours of each Saturday afternoon. And on weekdays it's deserted after 5PM, when everyone is actually off work to stop by. Plus its location on York makes it a potential outdoor patio spot that will be less drowned in the diesel fumes along King and Main. The market better step it's game up, and fast. Nations has been absolutely bursting since it opened. And go figure - amazing selection of hot food options and lots of seating. The Mustard Seed opened on the weekend and after leaving with our first haul of groceries from there, I said to my wife "this is what the Farmers Market should be like", referring to the selection and local offerings. The Market has amazing vendors, although it could use more. And it seriously needs an injection of lunch/dinner options like Byward or St Lawrence in Toronto. Above comment is bang on - our patio culture is non-existent. York could have been redone as 2-lanes, curb parking and large street trees on both sides. Instead we maintained the high-speed traffic vibe and have no trees. All the stall holders ideas for things to change are things for OTHER PEOPLE to change but the real problem is the offerings themselves. Give me offerings that're worth going to the market for and for crying out loud be OPEN when I get there. That is all. Everything else is window dressing. Besides the inconvenience of showing up at the market, only to find the stalls that sell the items you came for are either closed or out of stock, the other problem is the negative atmosphere this creates. Arriving at the market three hours before closing to find empty shelves and people shutting up shop (or simply closed) does not project a positive, professional attitude. Combined with grumpy complaining stallholders and spotty quality in some stands the overall impression makes you wonder whether you've stumbled upon a soviet era market where everyone is grumpy, the shelves are bare, and some stallholders are just going through the motions of running a business because there is no alternative. I personally like the renovation, but I can understand not everyone likes the bright orderly design. But if the market itself were excellent it wouldn't matter. Remember, people go to farmer's markets on parking lots all the time. Actually having the market operational for the hours they advertise is the single most obvious fix that's needed to make it a more appealing option for buying groceries. I work less than five minutes' walk from the farmer's market and would love to be able to drop in after work at 5:00pm to grab ingredients for dinner, but this has been laughably impossible every time I've tried it. The early closing is far more frustrating on Saturdays when I actually have time to shop but can't be guaranteed to find what I need if I dare set out any later than 1:30 in the afternoon. Sometimes (I find especially in the summer), you can still have a decent (if still spotty) market experience in the afternoon, but at this time of year it seems half the vendors can't be bothered to stick around. Probably the very worst was this past December 31 when I biked over around 2:00 to get cheese and other snacks for New Year's Eve only to find most of the vendors not only closed, but still drifting around the market chatting among themselves. Thankfully Denninger's is even closer than Nations and a lot more reliable but it's beyond annoying when the market is literally forcing me to go elsewhere during its so-called open hours. Sound like all the above comments have hit the nail on the head. Someone in a position to steer policy should do something about it, rather than tunnel vision on "where will the cars park!". Sounds like they are driving away people that are already there, let alone there being a reason for people drive there. Premi killed the market, period. Just prior to the renovation we had a friend in from out of town and took her to the market. We told her they were soon to be relocating the market for the renovation and her only comment was "Why does it need renovating, it's great now!" So true. After years of going to the market every Saturday morning, even in the temporary location, we went a few times after the renovation and then stopped going. We haven't been there in at least 2 years, and have zero plans to go back. Very sad, because at one time we'd even make a quick market stop on our way out of town on Saturday mornings. In fact the market had to be renovated to meet current health and safety standards (e.g. washing facilities). There were also other heating, accessibility, truck off-loading and utilities issues. So, a major renovation was necessary to meet current building standards, but opinions differ on whether the "feel" of the market is better or worse than before. Obviously, a move is disruptive, but a similar renovation to the Art Gallery did lead to a huge re-birth (despite the fact the Art Gallery was actually closed completely for a couple of years). It has to be recognized, though, that the stall holders themselves were constantly complaining about the state of the market facilities before the renovation (and they complained when they had to move, when they had to move back and about the renovation itself once they set up in the new space). And most long-standing stallholders simply moved their old stands and equipment back into the new space, and did nothing to try to improve the quality and selection of what they offered they meet demand and changing tastes. One interesting fact, reported in the Spec, is that although stallholders are complaining about less business, actual surveys showed that the number of people going through the market doors is about the same as it was before the renovation. Although it would be preferable to have had a big increase, the fact that the same number of people are buying less suggests that it is what's on offer, rather than the building, that is the main problem. I agree with Steve. It's no excuse to claim it was all driven by the Code. They could have done it creatively and made it a success. THat famous glass wall with LEDs in it, how inviting has that been? And this guy is supposed to head our design review panel. 1 Better hours - There is no reason the market should be closed Sunday, Monday and Wednesday.If you want to do Sunday Monday that's fine, but there's no reason the market should be closed for three days, and certainly not an odd closure of Wednesday. That being said, if a Vendor doesn't want to adhere to this schedule, he doesn't have to. He just needs to provide clear signage of his hours on his booth and pay the rent. 2 Less Food Terminal Vendors - If I want food terminal food, I can go to nations or any other grocery store. Have two food terminal vendors and that's it. 3 Adjust the stall sizes/hall sizes - The current market is too crowded, which is hilarious because there are several empty stalls. Make adjustments with this in mind. 4 Open to the Outside - The buffer area by Sensational Samosa is sheer idiocy. This entire section has more width and open up to the street during the summer with patio seating. 5 Allow Food Trucks outside - York is not and should not being a high speed traffic vein like King/Main. During the summer, having at least one Food Truck there to work with the Patio adds a certain closeness to the area. 6 Shut down one lane during the summer. Make room on the sidewalk for an outdoor portion of the market. This in turn also give more incentive to may Bay St two way as well. 7 Use the Food Court - The Market has a completely serviceable Food court outside. Expand the market to include this area for cooked food vendors. 8 Free Parking - If Nations is allowed to validate parking, the market must follow suit. You might not like it, but it's a severe competitive loss if Nations can offer this and the market can't, especially with how many exotic selections Nation's offers. That being said, keep the parking restricted to the underground parking or the parking plaza. NO MORE STREET PARKING! 9 Streetscape York - York needs more green, York needs the Parking facility bridge to be more then a monument to rust, York needs the parking lot at York and Park turned into a Park, it needs the buildings with those exposed rusted metal vents and aluminium siding facade turned into something that fits the well kept Copley and Memorial Church buildings, or turned into yet more green-space. 10 Keep the Birks Clock Working - I get that the clock is an antique, but it's imperative you keep the Clock running, working and the knights charging. It's a unique item to the market, and is a monument that you should be using to Brand the market with. A clock that kept watch over the city's heart and the crossroads of downtown commerce for over half a century is now being quarantined in a modernized parking garage. An ornate anomaly that was old-timey at birth (drawing inspiration from the Late Middle Aged Wells Cathedral clock) and is arguably out of step with the cool, contemporary Market. Let's take a timepiece that was once a landmark for meetings 365 days a year and put in a glass box that is open to the public 4 days a week. And in recognition of the clock's rich civic history, let's erase the name from the clockface and leave the brass historical plate affixed to a pebblestone obelisk supporting a security camera three blocks away. A monument, to be sure. Sadly, Jepson actually complained about the market opening up to the street and having extra outside fruit and vegetable stands during the summer. That having a lane closed on York for the farmers' trucks made it "confusing" for drivers. They would be so discombobulated by seeing a closed lane that they would not know what was going on and be unwilling to visit the market. That shoppers would buy fruit and vegetables outside instead of going into the market to buy meat from his butcher's stand (?!). So, here you have a stallholder actively arguing against the things shoppers actually want and trying to shut down expanded seasonal selection of produce, because he is worried that if you buy produce outside, you won't buy meat inside (and closing a lane is so frightening that drivers will high-tail it out of town rather than driving past the food trucks!). York is not and should not being a high speed traffic vein like King/Main. Agreed! And neither should King or Main. That I will disagree on, but that's an argument for a street conversion post. Re: 8. I'm pretty sure that Nation's pays for the privilege of being able to validate parking. If the stallholders want validated parking, they probably should pass the hat around amongst themselves to cover it. Also, what do you mean by street-side parking? Street parking is the only parking Downtown that's actually priced for short stays instead of all-day commuters (well, except on weekends when it's taken all day because it's free). Agree on all counts. In fact, I hope someone from the market is reading all the comments on here. Great feedback and ideas. Now here is an honest question jason. Not trying to start stuff, if #9 involved a demolition and building/park replacement of the building's I'm referring to, would you still be behind it? That is of course assuming, reputable developer, has full plans, has proven financing. Not to say that would be needed, just saying if it was on the table. I know many would outright say no. Why, when there is so much land already empty? Not to mention, what's the point of speculating on an idea that is so far away from being real that it might as well exist in the game of thrones world? Just to have a fight? I don't think the market should change for you. You are not the only person who goes to the market. You should adapt and enjoy what we have instead of biting and complaining about it like most people in this city. My thoughts exactly! We are proud of what we have. We welcome ones who shopped and not complains. Unfortunately, with many other options available adapt = shop elsewhere. I believe everyone's heart is in the right place: Success of Hamiltons Farmers Market and its history. I am a big supporter of the farmers market unfortunately my attendance has withered over the last couple years with inconsistent stall opening/closing. The rest is just window dressing to me. The products are the most important aspect to my shopping experience. Some notable stalls that have shown me that they know their offering is the big draw: Sam's Cheese, The Bakery Lady, the Flower guy with the old school change belt and a few of the produce stalls. However, I drive to Paris ontario to a small independant farmers mini market for my cucumbers (pickles) and strawberries (jam) every year because the farmers market has let me down time and time again for my preserves. For how many people was this their first experience of the market? How many of those people will bother coming back? Thanks for posting this picture of why the market's problems are far more to do with unprofessional stallholders than the re-design or Nations or free parking. 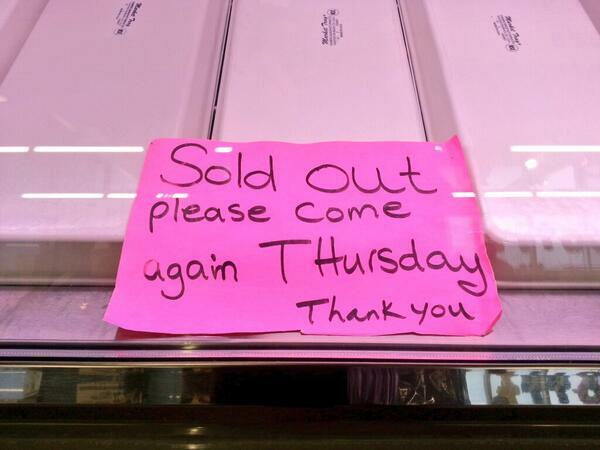 How can a chicken stand sell out and then close down with five or six more hours until the market officially closes? Is business really that good that they can afford to close down most of the day (and alienate actual and potential customers in the process)? I've also shown up at this stand at 1pm on Saturday to find them shutting down because they've 'sold out' already. People buy food to eat. Not being sure that you can actually buy the basics you need for dinner is pretty damning for a market! I love the market and always think of it as one of the treasures of the city, but in the last few years it has been getting difficult to maintain my devotion because of the substandard and unreliable service of some of the stallholders. Between Christmas and New Years I had multiple similar experiences trying to spend my money at the market. One day I went to get ground pork at Jepson's for a tourte de noel. I asked for some ground pork, and he told me he didn't have any fresh meat that day and that no one else in the market would have any fresh meat either. When I asked for some frozen ground pork, he told me he didn't have any either ('just the the stuff from the freezer on display'). Luckily, I went downstairs and the butcher there kindly ground some fresh pork specially for me. A few days later I needed some pork chops. I said to my friend that I'd give Jepson's another try since I do want to support them (they make great sausages). She didn't understand why I still insisted on trying to shop there after all the bad experiences I've had recently. But in the end it didn't matter because their stand was closed for the day! So I just went to Nations. If even someone who goes out of their way to shop at the market is finding it increasingly hard to actually spend money there (because they are closed unexpectedly or sold out or don't stock some basic product) things are getting bad. you didn't need to eat today did you? or tomorrow? "please come back thursday and don't go to nations"
Hi Jason, while I am happy you spent time in our city's farmer's market I have some points to make about your commentary. Our family of five can never find a table because all of them are bolted down furniture with a maximum of four seats, and they are always taken. We always end up with a kid sitting on our lap. According to StatsCan (http://www.statcan.gc.ca/tables-tableaux/sum-som/l01/cst01/famil40-eng.htm), the family average is 3.1 for a husband-wife household. You are above the average. Get rid of the white tables and chairs downstairs and in the front foyer area and replace them with a lot of Paris-style chairs and round tables. People can have a table for two, or assemble a group of ten together if they want. The round tables are certainly not easy to have a large group sit around since they don't line up nicely. Ever taken a look at Lime Ridge in the food court where this is, say, near the washrooms? It's a nice thought, but no. Go with smaller, square tables. You're mistaken. I went there near every weekend this past summer and they open at street level. Lets a nice breeze in, easy to go from inside to outside. the ambiance in the front glassed-in foyer is dead. It's like eating lunch in a hospital cafeteria. Perhaps it was the time you were there, I've seen that area busy with people eating, talking, enjoying life. I thought they piloted this? I remember seeing street vendors in the curbside lane (or at least their trucks) with stalls on the sidewalk. Think Byward Market in Ottawa. We go there all the time and there are tons of lunch options. I trust you're taking public transit on these trips, as well as to the market, since you are such a vocal proponent of the bus lanes and public transit? While I agree with a lot of what you've said - having a nice area to sit and enjoy a cup of coffee, read the paper, have a bite to eat, catch your breath with a full load of groceries - there were some factual errors in your article, or basing an opinion on a single time you were there. Thx for the reply...Couple quick thoughts. If I'm a business owner I want to make it as convenient as possible for customers to enjoy the experience whether they have 3.1 in their family or 10.
no, the market doesn't open to the street. Sensational Samosa and 3 tables do. yes, they piloted this, but as I mentioned "the curb lane should be filled with market stalls, not trucks". well it looks like the market is getting validated parking starting February. Pilot program, naturally. Good that they're doing it. But it still leaves a need for the offerings and consistency to be a little more competitive. Hard to believe that four years ago that the City dropped $13 million into renovating the Library/Market and another $2 million on the York Boulevard facelift. Compare today’s Guantanamo food court design with the movable Vitra Panton chairs and café tables shown in the initial renderings. The city’s designs on York Boulevard were only slightly more verdant. All interesting points. I don't go to the market but I can attest to how bad the streetscape is on York. It's just a bloody expressway going into the city with one useless lane going west that nobody uses. Make it a real two-way street. Plant some trees. Have patios. Done. I know this vendor, I shop there all the time. They're closed on Tuesdays. They have the best chicken in the market. And that's a problem. All stalls should be open market hours. If not they should be fined or removed. Try running a store in a mall and set hours different than mall hours. Most forbid that in their leases.